Free native trees and shrubs are now available to streamside property owners in the Genesee River Basin. Water quality in the Genesee River is impacted by both phosphorus and sediment pollution. Planting trees and shrubs along the banks of streams and rivers can help improve water quality. The Genesee River Basin Trees for Tribs Program aims to increase the number of trees and shrubs along the river and its tributaries. Trees and shrubs planted along streambanks provide many important ecosystem services. They help filter nutrients and sediment out of runoff before these pollutants can reach streams. The roots help stabilize streambanks, making them less prone to erosion and more resilient against flooding. They provide habitat for fish and wildlife species and even help keep streams cool, which is necessary for many fish species. Planting trees along streamsides is an inexpensive way to protect our water quality, our fish and wildlife, and our property! 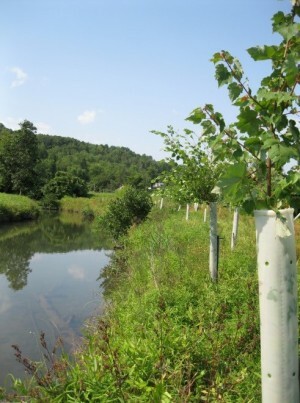 Trees for Tribs helps property owners plant more trees on streamsides and is a program of the NYS Department of Environmental Conservation Saratoga Tree Nursery. The Genesee River Basin Trees for Tribs Program focuses on 4 priority areas, including the Oatka Creek sub-watershed, the Upper Black Creek sub-watershed (upstream of Byron), the Honeoye Creek sub-watershed, and the main stem of the Genesee River from Mt Morris to Scottsville. The map to the right shows the 4 priority areas. We have the goal of planting 15,000 trees in these Genesee River priority areas in 2016! The program is available to any type of property owner, including private landowners, municipalities, businesses and community organizations. Projects both large and small are welcome. Trees for Tribs creates a partnership with property owners to plant trees. • assistance selecting the number and types of trees and shrubs. • protecting the plants from cutting or mowing. Step 1: Determine if you are located in one of the priority areas. You may contact your local Soil and Water Conservation District or the Genesee River Basin Trees for Tribs Coordinator. If you are not located in a priority area, click here to find out other ways to be involved. Applications will be accepted on a rolling basis. However, if applications exceed our 15,000 tree goal, then we will move to a competitive process based on our project selection criteria. Apply early to guarantee your trees. Trees for Tribs is committed to planting native trees and shrubs. Staff from Trees for Tribs or your local Soil and Water Conservation District can help you select the appropriate number and type of trees. The Genesee River Basin Trees for Tribs Coordinator will arrange a time and location to drop off the plants. Then, with friends, family and even volunteers, property owners will plant the trees and install the tree tubes. If a planting is followed by dry weather, property owners will need to water the trees to help with their survival. Property owners will also commit to not mowing or cutting the new trees. Step 6: Enjoy your new trees! Not only will your new trees look nice, but they will also help protect water quality and will benefit fish and wildlife. You can still be involved in Trees for Tribs. We are always looking for volunteers to help plant trees on larger sites. Contact the Genesee River Basin Trees for Tribs Coordinator to be put on our volunteer list. You can also purchase trees directly from the New York State Department of Environmental Conservation Saratoga Tree Nursery. Click here to find out more information.